Curry Up Now, the popular Bay Area-based fast-casual concept known for their innovative take on Indian cuisine, is now offering Hungry Planet™ plant-based chicken at their San Jose and San Mateo locations, with plans to roll out the protein at their four additional Bay Area locations over the next few weeks. 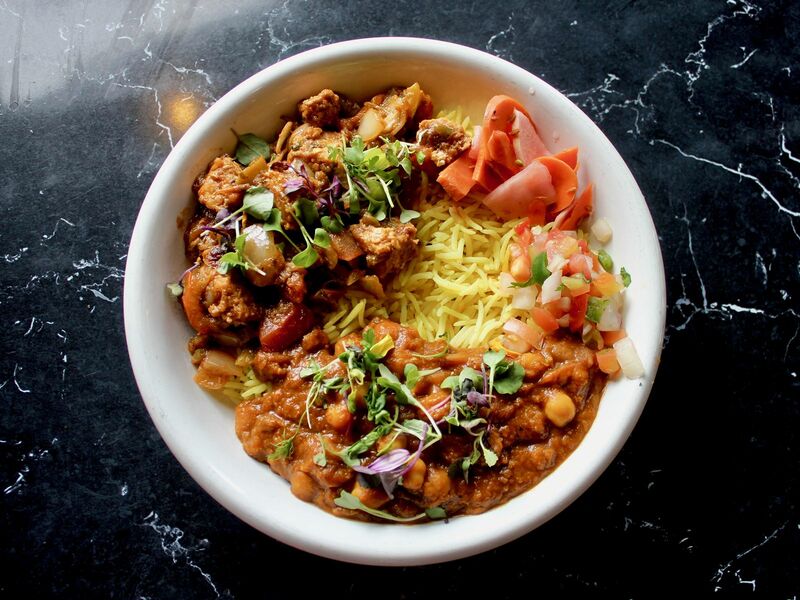 San Francisco, CA (RestaurantNews.com) Curry Up Now, the popular Bay Area-based fast-casual concept known for their innovative take on Indian cuisine, has announced the addition of Hungry Planet™ plant-based chicken in-store and on the catering menu. The Range-Free™ plant protein chicken is available now at Curry Up Now’s San Jose and San Mateo stores and will be rolled out at their four additional Bay Area locations over the next few weeks. Hungry Planet’s premium plant-based “meats” prepare, cook, and taste like traditional meat with the added benefits of being high in protein, low in calories, and free of animal ingredients, GMOs, antibiotics, hormones, and cholesterol. Hungry Planet is known for producing the highest quality plant-based meats developed especially for chefs to use as a 1:1 substitution in their favorite recipes, or to create innovative new entrees. By cooking with Hungry Planet’s plant-based meats, world-class chefs and forward-thinking restaurateurs are delighting omnivores, carnivores, vegans, and vegetarians alike with delicious options that look and taste like traditional meat, but are made entirely from plants. The 100% plant-based “range-free” meats use fewer resources for production, resulting in an environmental footprint that is 95% lighter than that of traditional meat products. Curry Up Now is the first concept in the Bay Area, and one of the first in the country, to serve Hungry Planet’s plant-based chicken. The Range-Free Chicken™ plant protein will be available as a protein option in Curry Up Now’s new Hungry Planet Burrito and Hungry Planet Bowl, as well as being offered on their catering menu. The Hungry Planet chicken joins Curry Up Now’s wide variety of vegan and vegetarian menu options, but is the first plant-based protein on the popular Indian concept’s menu. Curry Up Now is the first concept in the Bay Area to offer Hungry Planet’s premium plant-based “meats,” which prepare, cook, and taste like traditional meat with the added benefits of being high in protein, low in calories, and free of animal ingredients, GMOs, antibiotics, hormones, and cholesterol. Curry Up Now partnered with Fransmart, an industry-leading franchise development company, to grow the concept through franchising. Curry Up Now is actively looking for experienced multi-unit foodservice operators to develop franchise territories in major markets. To learn more about Curry Up Now franchising opportunities please visit http://go.fransmart.com/CurryUpNowApply. Established in 2009, Curry Up Now was conceived by Akash Kapoor and his wife Rana and ably supported by co-founder, Amir Hosseini. There are currently Curry Up Now locations in Alameda, Palo Alto, San Mateo, San Francisco, Oakland and San Jose, as well as four food trucks rolling under the same name. Curry Up Now has been named as one of Zagat’s ‘5 Hottest Fast-Casual Chains,’ ‘SF’s Best Indian Restaurants’ by EATER SF, and ‘100 Things To Eat Before You Die’ by 7×7. Mortar & Pestle is a craft cocktail bar connected to Curry Up Now’s San Mateo and San Jose locations. Known for taking Curry Up Now’s imaginative Indian approach to the cocktail scene, Mortar & Pestle serves up innovative libations in a chic and modern atmosphere. After more than 10 years of research and development, Hungry Planet ™ has developed the most complete range of premium plant-based meats that match the taste and texture of traditional meat. Developed to delight the discerning tastes of meat lovers in the heart of the Midwest, Hungry Planet’s 100% plant-based Range-Free Meats™ use fewer resources from planet to production, and are better for consumers and the planet. Hungry Planet’s plant-based meats include ground beef, chicken, pork, Italian sausage, chorizo sausage and crab in bulk and in ready-to-cook patties. This complete range is now being released and made available to culinary professionals across the country. Hungry Planet™ and Range-Free™ are trademarks of Hungry Planet. To learn more about Hungry Planet, visit www.hungryplanet.us or @hungryplanetfoods on Facebook and Instagram.